To refresh your memory, the ABCT states that inflationary monetary policies such as those of the Fed for the past five years will cause an unsustainable boom as new money pours into the economy and stimulates demand for consumer goods and for investment. Usually we think of the ABCT in terms of a single nation, but the EM problems demonstrate that it has international implications, especially in a world of increasing trade integration and a currency that other countries use for trade and their banks for reserves. I know. What Mises wrote is backwards to what mainstream economics and the financial media have taught you: trade in goods happen first then money follows to square the balances. But give Mises’ explanation a chance. Much of Austrian economics contradicts mainstream theory. Mises wrote about international trade. I’m concerned here with international investing, but the same principle applies. Just as consumers will buy imported goods if they Fed creates more money than US citizens want to hold, investors will “import” investments (export money) if they can’t find opportunities in the US as profitable as those in other countries. As a result, the Fed exports its unsustainable boom, often to emerging market countries, one reason that Fed monetary pump has not generated the higher inflation in the US that the Fed would like. The emerging market situation reflects another aspect of the ABCT: most emerging market nations export commodities such as metals, food, coal and oil. In the Austrian taxonomy, they produce higher order goods, consumer goods being the lower order. In another analogy, commodities are at the headwaters in the production process and flow downstream through many transformations before becoming consumer goods. Commodities are much more sensitive to changes in the money supply because producing them is such a capital intensive process. As a result, commodity production is much more volatile than consumer goods production. 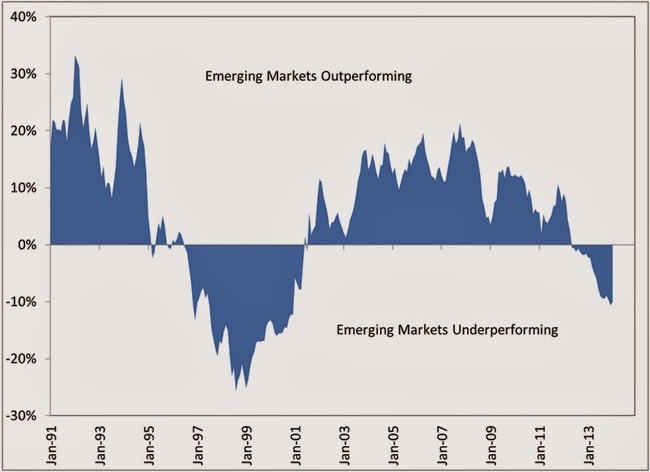 So emerging markets are facing two problems: 1) the withdrawal of investment funds from the US, which will cause higher interest rates in those countries and 2) a collapse in the demand for commodities as the boom ages and turns into a bust. If only the Fed could see the damage it causes. Ludwig von Mises, Human Action: A Treatise on Economics, Scholars Edition, 1998, 446.